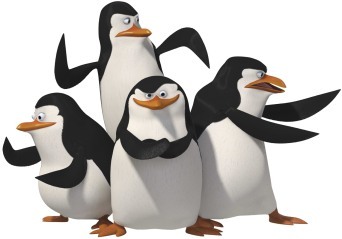 I have decided my new favorite characters in film are the penguins from the movie Madagascar. I didn’t see that in the theatres, but I remember seeing a Christmas short with them in it and really enjoying it. I love the four way interaction of the characters: Skipper (also, “Joe”? ), Kowalski, Private, and Rico. It’s a whole lot of fun to watch. In doing some, “ahem” research on this and found that wikipedia has a whole category of “fictional penguins.” I was happy to see Badz Maru and Tux on there. They have their own page as well. That also rocks. I know someone whose name is Pinguino. She runs Penguin Palace. She’s not listed, although she draws a mean penguin (ninja penguin, actually). Last night I got into a conversation with a fellow “on a journey of changing and growing” (as I am) about free will. It’s comforting to know that wikipedia also does an admirable job with that topic as well. I found myself defending the universe’s arbitrary nature as a mystery. I was arguing that it “feels like we have free will” and that pretty much, we’re limited by that. The fellow I was talking about was asking about the fact that other people also have free will too, and asked if their free will affected my free will. I said that “yes indeed, people affect other people, this is the way things are set up.” He asked why God would allow people to do bad things with their free will, maybe (s)he/it/they might intervene and protect us from such things. My answer was that perhaps we’re meant to learn something. I vividly remember arguing, as a college student (maybe 20 years old?) that pain was not required to learn things. Well, I’m 36 now, and I can tell you that my experience is that learning only comes with some degree of pain. I admit it would be nice to take a week or month off from this fact. It’s nonetheless true that this does not happen very often. Hey, I’m learning to listen to my inner voice and let it guide me in my life. Also, funny penguins are funny. Joe Crawford blogged this at 10:06am in 2006 in June. The 20th was a Tuesday. You are reading this 13 years later. Comment. There are 3 comments Tweet. Send email. It has no hastags.